Thursday started out in a mad dash as we began the day having coffee with the neighbors across the street. I brought over my standby, this Swedish Visiting Cake, which I have made many times over the years. The recipe is from Dorie Greenspan's cookbook and it is fool proof. It's simple, very impressive in taste and always a hit. For lunch the same day we had a friend over that was traveling from the east coast. We have not seen him for a couple of years, so I wanted to treat him to something special from the Pacific Coast. 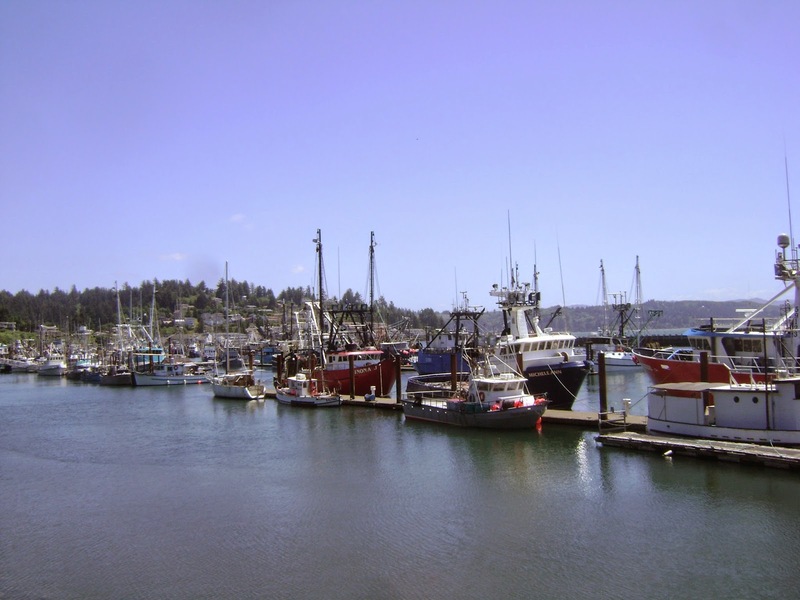 The day before we drove up to the town of Newport which is 25 minutes away to pick up a Coho salmon from the docks. 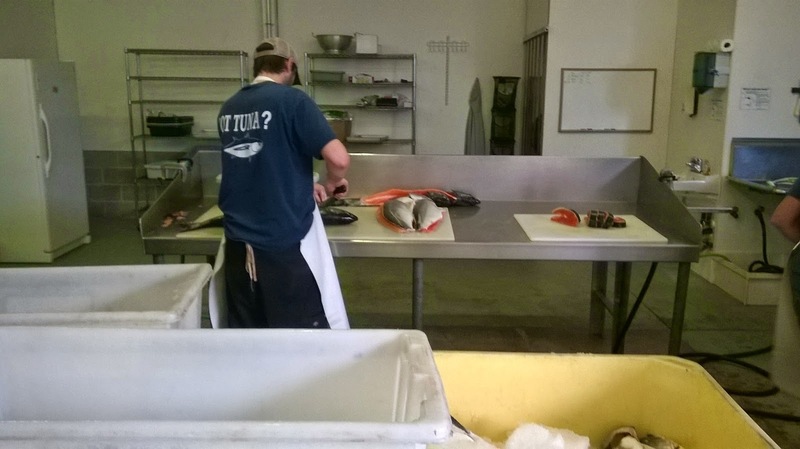 We had the fish filleted on the premises. The recipe I used is from the June Bon Appetit magazine, Into the wild, Salmon each way, article. What drew me to this particular recipe was the cooking method. The salmon is rubbed with lemon zest and olive oil and then baked in the oven on low heat. I served the salmon topped with sesame seeds and a drizzle of sesame oil. Preheat oven to 250F. Place salmon in a large baking dish, drizzle with 2 tablespoons olive oil and lemon zest; gently rub into the top and sides of the fillet. Season with salt and top with garlic. Bake 35 to 40 minutes until center looks almost done. (recipe calls for medium rare, so I cooked these a little longer). In the meantime, combine rutabaga with olive oil and 1 cup of water in a medium sized sauce pan, bring to a simmer, cover and cook until fork tender, remove lid and cook until water evaporates and vegetables are golden in color, stir occasionally, season with salt and pepper. Remove from heat, set aside. While rutabagas are cooking prepare the chard, in a large skillet add 1 tablespoon olive oil, then the shallot and Swiss chard, cook tossing often until leaves are wilted. Toss in cilantro, parsley and lime juice, season with salt. Drizzle salmon with sesame oil. Serve along side the Swiss chard and rutabagas, topped with sesame seeds. Thanks Tandy, the salmon was like butter. Hi Sherry, rutabagas are a root vegetable, kind of like a turnip, they are delicious! It sounds like there are so many lovely flavours in this salmon dish, Cheri. And I'm definitely going to check out the Swedish visiting cake. Love the name and it's great to have a trusty cake like that that you know will always turn out well. Hi Helen, not sure how many times I have prepared the cake, but it's a tried and true recipe and I love the Oregon coast, life would be perfect if I was not so far away from my family. My favourite fish! Your salmon looks very tender and juicy. Hi Angie, it really was moist, salmon is my favorite as well. I've never slow cooked salmon before but gosh this sounds good. Hi Maureen, this was a wonderful method, will be trying my hand at this again. I know really, and it is good. Thanks! Hi Gwen, it was a great day, thanks for stopping by! I'm new to loving salmon and this recipe sounds like a must have! Hi leah, it was a great way to prepare salmon, I will be making this again. I just cooked a salmon on the weekend, Cheri. It is by far my favourite food. This looks fantastic and the recipe enhances the flavour beautifully. 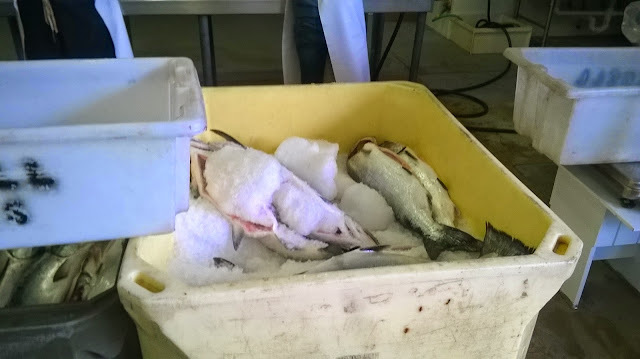 Don't you just love getting fresh salmon right from the boats? Beautiful job! HI Robyn, Thanks, we sure love the fish here, so fresh. Your recipe was wonderful! Hi Mark, it was so nice visiting with you, had fun. Wish we had more time. Maybe next trip. Thank you, the visiting cake is the best little treat I found to have with guests, it looks plain but the flavor is amazing. And you can never go wrong with fresh wild salmon. Ooh Cheri. I love your salmon recipe. You are so right. great minds do think alike. Hi Marlene, I know, right! love your recipe! My other half loves salmon. I can't wait to try this one out for his dinner soon. Slow cooking fish goes against everything we are usually told to do, but this sounds delicious! Hi Amy, this was a great method, my first time. The texture and flavor were delicious! Thanks! It is by far my favourite food. This looks fantastic and the recipe enhances the flavour beautifully. Don't you just love getting fresh salmon right from the boats? Beautiful job! thanks. Hi Food, yes fresh and wild is the way to go if you can do it. I have to try to bake salmon in low heat, like your did. It looks perfect! Hi Ela, is was delicious! Thanks! This is one deliciously healthy dish! I have never tried salmon with these healthy sides :). This makes it a must-try for me! 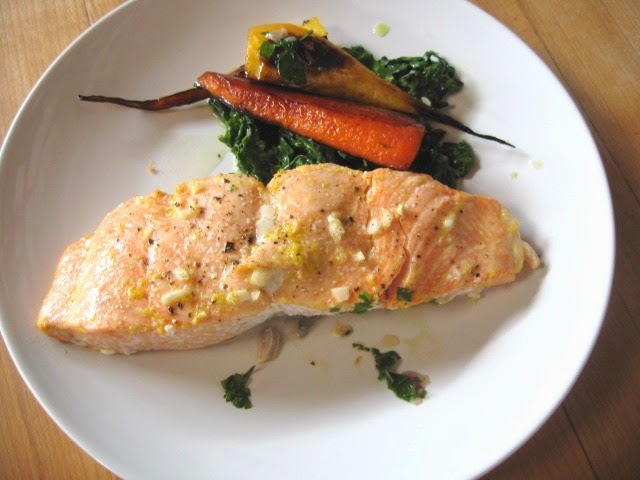 Hi Julie, the combination was great as salmon seems to hold up nicely against strong flavors. Thanks for stopping by. Your salmon must have been very flavorful especially being so fresh. Your friend must have enjoyed the meal. Thanks Karen, we had a very nice time. I agree, the slow cooking method is interesting. Just wish I could get some fresh fish like that. Hi Lea Ann, we live in Phoenix 7 months out of the year so I really know what you mean. I have never cooked salmon before but I must say that Cheri this looks amazing!! that last pic is mouth watering! Thanks Ami, it is my favorite fish! Hi Cheri. Sounds like a perfect day. What a lovely salmon recipe. Bon Appetit never fails! I'll have to try this cooking method. We do buy a lot of salmon, how could you not living in the Pacific Northwest...right? Hi Seana, your so right, one of the zillion things I love about it. Thanks! we had such a wonderful time! I love this cake too. A wonderful fish dish and tasty combo. Hi Rosa, thanks for stopping by, Happy Tuesday to you! Oh My! Looking at the pictures and reading the recipes, I could smell the fresh ocean breeze inland... all the way to the Spokane Valley. I will try this soon! This salmon sounds incredible. I roast it all the time but in typical high heat...would love to try this method. And I know that cake of Dorie's! I've only made it once and I wonder why..so easy, so tasty! Hi Monica, yes, I always roasted or grilled before, this method is also a great one, the salmon is so soft. I usually cook salmon hot and quick so will have to try this way. My sister once cooked a whole salmon in her dishwasher but I've never been brave enough to try that! HI Anne, how interesting about the dishwasher method. I'm not sure if I would be brave enough either. But I googled it and people really do this, it's supposed to render a moist fish. I love salmon and i would love to be a visiting guest in your house! What fun to be able to buy fish like that! Nice way to cook fish. And less chance of spoiling it. Plus, great to read someone else that cooks with rutabaga, or swede as it's called here. So few people seem to use it these days. I love it pan-fried until golden. Much more intense, and sweet, in flavour. Although with salmon I wouldn't serve the swede that way as it would be too flavoursome. Hi Johnny, how interesting? did not know they are called swede, during the winter I cook with them a lot as I roast root veggies of all kinds together. My stomach is growling at this gorgeous salmon! Such a simple way to cook it, but it really lets the salmon shine! Hi Joanne, your right, simple is the best. Thanks! Hi Bam, so nice you grew up with a garden, have not have a raw rutabaga before, will have to try. I have yet to try slow cooked salmon, thanks for the inspiration Cheri! Hi Mike, if you have the chance it's worth it, the texture is like butter. I love this dish and I super love all the freshness you added to it! Lovely dinner! Thanks Pamela, we loved it too! This is such a creative combination --- I love rutabagas, and you never see them featured anywhere --- great recipe! Hi Sue, in the beginning I was on the fence about the rutabagas, so glad I did use them, they are delicious! You had a delicious Thursday in the kitchen! The salmon looks amazing, I've never done it in a slow oven but it sounds great! Hi Chris, I know before I always cooked it fast and hot, that still is delicious, but this turned out like velvet or butter. Wow, what a dish! I envy you your easy access to good fresh salmon. And I love Swiss chard, so this is the perfect meal for me. Thanks so much. Thanks John, we enjoyed this meal as well, thanks for the nice comment. This salmon looks super delicious, Cheri! Great combination with the rutabagas and chard- and can't go wrong with the sesame oil. Hi Sarah, yes I should use sesame oil more, love the flavor it adds! Hi David, yes and I feel so fortunate! Thanks for stopping by. It looks so good. I love salmon, I wish I could get it that fresh!